The Adagio is a two-way transmission line design featuring a 1.5" circular ribbon tweeter and dual 6.5" midrange/woofer drivers. The larger cabinet and transmission line allows the Adagio to play lower than the Adagio Junior. The tweeter and drivers are time-aligned and utilize a D'Appolito MTM arrangement to provide incredibly coherent and life-like sound. The underhung drivers and ribbon tweeter provide for extremely accurate, low-distortion sound with incredible clarity and detail. The curved cabinet reduces enclosure resonance and the protuding baffles reduce diffraction artifacts. As all Acoustic Zen speakers are perfectly matched, the Adagio will provide a seamless soundstage when paired with any of its siblings. Available in a variety of finishes including but not limited to Black Pearl, Maple Burl, Golden Burl, and Figured Red. 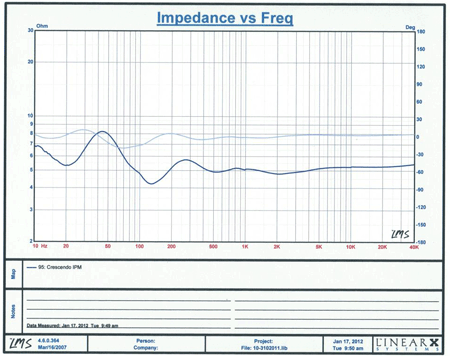 The impact of impedance and phase on speaker design and music reproduction can be difficult to understand. A simple explanation is that as impedance and phase change, almost always independent of each other, the speaker becomes harder for an amplifier to drive and there will be a subsequent increase in distortion and delay in the sound. Significant research and development has been done to produce the flat impedance and phase found in Acoustic Zen speakers. In addition to lower distortion, this has two immediate and obvious benefits: time coherence and ease of amplification. Time coherence means that all of the individual notes will arrive at your ears at the time they were supposed to. Ease of amplification means Acoustic Zen speakers can be driven just as well by a low wattage tube amplifier as by a solid state megawatt monoblock. The combination of multiple drivers and a complex crossover into a single speaker will influence the time at which different frequencies are produced and when individual notes and sounds will reach your ears. When these individual sounds arrive out of sync, music will smear together and become less coherent. The flat phase in Acoustic Zen speakers ensures all sounds are produced as originally intended, and that all sounds reach your ear at the correct time. This results in music that sounds natural and coherent, just like if you were listening to the original instruments or singer. Often a manufacturer will suggest their speaker works best with a specific type of amplifier, like tubes or solid state. 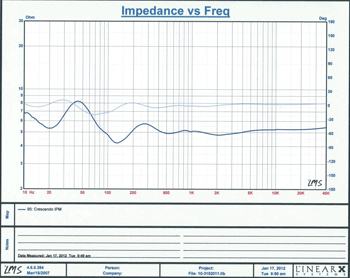 Or an optimium power rating will be listed, indicating a speaker that is difficult to drive and therefore requiring a more powerful and capable amplifier. That is not the case with Acoustic Zen speakers. The flat impedance and phase of Acoustic Zen speakers means you can use a single-watt tube amplifier or a megawatt solid state amplifier and achieve musical bliss with either one. In all cases, the sound character of the amplifier will come through clearly and in its purest form. Underhung drivers utilize a voice coil that always remains within the uniform area of the electromagnetic field. This ensures the driver experiences a uniform force while moving back and forth, and results in significantly lower distortion and more accurate sound at all frequencies and volumes. Underhung drivers are more expensive and more difficult to work with than the overhung drivers found in other speakers. Speaker manufacturers often compensate for the issues associated with overhung drivers through their crossover and cabinet design, but better results will be achieved by using underhung drivers to begin with. A transmission line acts as an acoustic waveguide to produce clean, accurate bass without the time-, phase-, or resonance-related distortion associated with a standard port or passive radiator. With proper tuning and damping the bass will be powerful, tight, and cover a wide range of frequencies as if being produced by a traditional driver but without requiring larger cabinet sizes or lowering speaker sensitvity. All Acoustic Zen speakers utilize a reinforced enclosure with curved walls and precisely designed baffles to minimize cabinet vibrations and produce clean, low distortion sound. Acoustic Zen speakers have consistently garnered "Best Sound" and "Best Room" awards at every show we attend. Our speakers faithfully reproduce the full range of music with low distortion, dynamic impact, coherence, efficiency, and realistic imaging. There is a reason for that and I'd like to share some of the inside story around why that is and how our speakers differ from other speakers. A speaker is the most difficult component to properly design and manufacture in the audio chain. At the same time, it's one of the easiest to bring to market because it's not always terribly expensive; drop a couple of high quality drivers into a box and voila you're in the audio business. That's why there are so many speaker manufacturers. But the truth is very few speakers exist that are properly designed and engineered, and truly sound like music. A great speaker has to simultaneously reproduce 10 octaves of complex frequencies while preserving the phase relationships of all those fundamental tones and their harmonics. It also has to properly interface with the room to produce an extremely wide dynamic range of sound, with musical and tonal balance and without audible distortion. In reality, these are difficult properties to achieve and one of the reasons I believe music lovers and audiophiles are continually changing speaker systems and components, searching for the elusive holy grail that will finally satisfy their ears and their heart. Let's start with some basics. Why do different musical instruments have different sounds, even though the musician is playing the same note? Different instruments use different methods for producing sound: strings of a guitar or a violin, reeds in a clarinet or saxophone, blown air in a flute or the human voice, or physical contact like a drum or piano. Ultimately, they all vibrate and cause the air around them to vibrate in sympathy to create sound. Different instruments are different sizes, materials, and shapes. All of those differences cause instruments to produce vibrations at many different frequencies when playing a single note. These additional vibrations are often called harmonics, partials, or overtones. The relative pitch and loudness of these overtones is what we call timbre. All of this complexity is why speakers sound so different from each other. 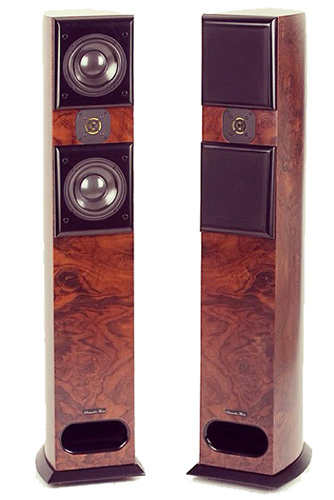 The drivers utilized in a speaker are its heart and most important component. We have chosen to use underhung drivers for the lowest distortion. An underhung driver's voice coil is narrower than that of a conventional driver, and therefore never leaves the magnetic gap of the motor assembly. Since the voice coil is always inside this gap, the magnetic field it is exposed to is more uniform across the entire range, and this results in lower distortion. The reason most manufacturers do not use underhung drivers is due to cost and complexity. An underhung driver requires components and materials that are more rigid and carefully matched within strict tolerances. When using overhung drivers, or drivers where the voice coil travels outside of the magnetic gap, the driver construction is less expensive and any anomalies in the response and distortion can usually be addressed with the crossover and cabinet design. Acoustic Zen speakers utilize an aluminum ribbon tweeter that is almost completely weightless compared to traditional dome type tweeters. This allows for immediate and precise high-end response to transients in the musical signal and reveals the dynamics of instruments with high frequency detail. Its extreme linearity provides time-coherent reproduction of music resulting in an accurate frequency response with rhythmic drive and outstanding image capability. Our tweeter is quick, without distortion and without ringing. A transmission line acts as an acoustic waveguide to produce clean, accurate bass without the time-, phase-, or resonance-related distortion associated with a standard port or passive radiator. The Adagio, Crescendo, and Maestro speaker drivers are transmission line loaded to extend the bass response cleanly and evenly across the entire lower frequency spectrum. The result is tuneful, taught, and deep bass that is time-aligned at the listening position. As shown in the following frequency response measurements, the result is extremely linear and coherent sound even at the crossover point between the transmission line and the other drivers. Transmission line loading is not easy to implement, but it eliminates the "chuffing" and time anomalies of ported or passive radiator designs and the power inefficiencies of acoustic suspension style cabinets. It is an amplifier's output signal that drives a speaker. But a speaker is seen as a complex reactive load by the amplifier. A reactive load has resistance, capacitance, and inductance. These three aspects combined create a speaker's impedance. As a result, the current flowing from your amplifier into the speaker will by become out of sync with the voltage by what is known as the phase angle. 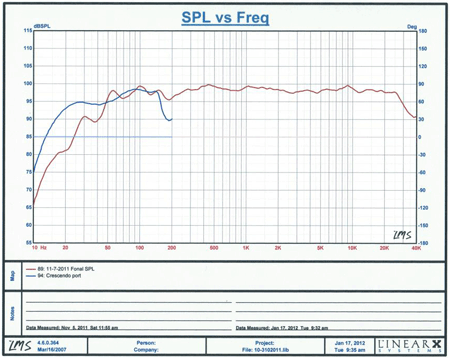 Have a look at these impedance and phase curves of a couple of very expensive loudspeakers reviewed in Stereophile magazine. 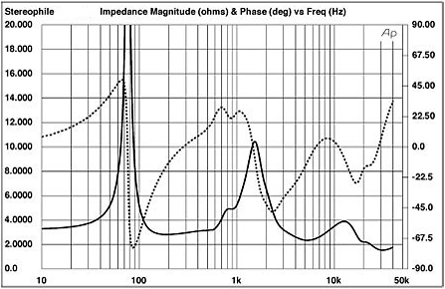 The black line is the varying impedance of the speaker at different frequencies and dotted line is the phase curve. In these examples you can see that the speaker's impedance varies anywhere from 3&ohm; - 15&ohm;, and the phase swings from +45° to -45°. This variance is fairly realistic for most high end speaker systems, but some will even exceed this. 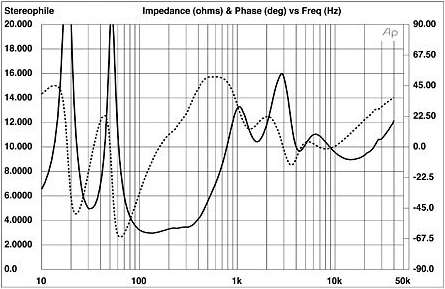 How do those variances in impedance and phase angle ultimately affect the sound quality the speaker produces? Ohm's law, which is the basic formula for almost all electrical engineering, tells us that voltage (V) is equal to current (I) multiplied by the resistance (R) in the circuit: V = I x R. This means an amplifier is affected by the resistance of the load it is driving, which is a speaker in our case. But in reality it's a little more complicated than that because the load of a loudspeaker is reactive and not purely resistive. For a reactive load the formula changes to something like this: Pavg = Vrms x Irms x cos φ. φ is the phase angle mentioned earlier and cos φ is called the "power factor". This means the amplifier output signal will differ from the original input signal, and as the impedance and phase angle varies some of the amplifier output is wasted as heat instead of being used to produce music. The worst case, which will not normally happen with a speaker, is when the amplifier sees ether pure inductance (phase angle +90°) or pure capacitance (phase angle -90°). Under those conditions, the voltage and current from the amp are 90° out of phase and no power is being delivered to the speaker. Because highly complex music changes very quickly, and amplifier output varies with different frequencies, the shifting phase angle will change the sound produced by the speaker. The amplitude or volume of individual frequencies will change and produce intermodulation distortion. This is why different speakers sound so different, even though most of them have similar frequency response measurements: the varying impedance and phase reduces the accuracy of their actual output. Now look at the measurements for an Acoustic Zen speaker. You will see the measurements for impedance (blue) and phase (light blue) are almost flat. Human ears are remarkably sensitive to vibrations in the air, especially in the 200 Hz to 4 kHz range which most instruments and the human voice occupy. If you are looking for lifelike sound and want to hear music reproduced as faithfully as possible, it is critical that your speaker has both a smooth and flat frequency response and smooth and flat impedance and phase curves. Acoustic Zen speakers provide fast and accurate bass. The time- and phase-aligned woofers, mid-range drivers, and tweeter work in concert to present a coherent point source and produce realistic, lifelike sound. On acoustic recordings, the original timbre and harmonics sound just like the real instruments and singers. The smooth and flat impedance and phase present an easy load so any power amplifier, tube or solid-state, will perform at their full potential. 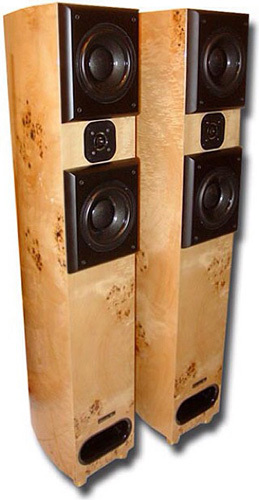 I have owned some of the best loudspeakers the world had to offer. All of these were highly recommended by reputable publications like Stereophile and The Absolute Sound, and all of them sounded different. I needed a reference speaker free from coloration and faithful to the music which is why I decided to design and build my own loudspeakers that would actually perform as I required. Of course it was very difficult to solve the myriad number of engineering problems inherent in creating a neutral and musical transducer. It took me more than 15 years of research and development to create a speaker that I thought did justice to the ideal of recreating a live musical event. The Crescendo in particular is the result of that hard work and meets all of my design criteria: natural, musical sound with a very flat and smooth frequency response; exceptional phase accuracy; an almost purely resistive load like those used when measuring amplifiers; and near perfect frequency response. We feel that there is no competitor, regardless of price, that can match the engineering achievement of our loudspeakers to provide natural sounding music as independent of the amplifier driving them as possible. If you are passionate about music, if you want to listen to lifelike sound, if you want the true spirit of music to touch your heart, then I invite you to listen to Acoustic Zen speakers. Start with the best, a pair of Acoustic Zen speakers, and you will immediately find satisfaction when listening to music.